Following a closed-door summit at UC Berkeley, leading West Coast seismologists recommended in a news conference today (Tuesday, April 5) the establishment of an earthquake early warning system in California, Oregon and Washington. The summit that began Monday involved earthquake experts and representatives from utilities and industry. The seismologists concluded that early warning technology is now mature enough for quake-prone states along the Pacific Ocean to build a system that could save lives and speed recovery after a large temblor. The scientists, some who had flown in from around the West Coast for the intense series of meetings, discussed the feasibility of establishing an earthquake early warning system along the Pacific Coast similar to the one that gave a valuable heads-up in the recent giant quake in Japan. They explored how such a system would work, what it could accomplish and how much it might cost, and discussed with utilities and industry officials how they might take advantage of such a system. Japan’s nationwide early warning system was launched in October 2007, tying the nation’s seismic detectors into networks that halt bullet trains, close valves at manufacturing plants and even send voice messages to cell phones warning that serious shaking is about to occur. After the massive quake on March 11, the bullet trains stopped as planned and restarted without incident, while the cell phone warning is known to have allowed at least some school kids to duck under their desks before the worst shaking hit. California, Washington and Oregon already have tsunami warning networks established, as does Japan, which can give hours of notice of an incoming tsunam. But Japan is one of few countries with an earthquake early warning system. Such a system would place seismic monitors in a dense arrangement in fault zones and could begin sending warnings of impending ground shaking within five seconds after an earthquake is detected by the nearest seismometer. In California, which sits atop the San Andreas Fault, some parts of the state could get as much as a one-minute warning, Allen said. In Washington and Oregon, where the seismically active boundary between the North American Plate and the Juan de Fuca plate sits offshore, the warning time is potentially longer. Even a warning of 30 seconds could be enough for a doctor to halt surgery, for a factory to shut down sensitive equipment, for a train to stop before it reaches a vulnerable bridge or for controllers to prevent planes from landing or taking off. That could save many lives and potentially prevent millions of dollars in damage, Allen said. “We are spending 1.3 billion dollars to retrofit the entire BART system so that we can have a robust transportation system, and it doesn’t do us any good if every one of those tracks is plugged up with a derailed train,” said John McPartland, vice president of the Bay Area Rapid Transit (BART) district Board of Directors and a member of the state’s Seismic Safety Committee. The seismometer network would begin sending data after the arrival of “P” waves, which are non-destructive waves generated by an earthquake that travel through Earth’s crust faster than do secondary waves (“S” waves), which can cause great damage. The scientists said that the warnings likely would begin as underestimates of ground shaking, but would become more accurate as long as the quake continues to grow. 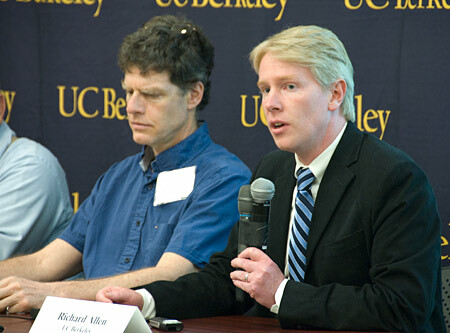 UC Berkeley’s Allen joined John Vidale, a University of Washington, Seattle, professor of earth and space sciences and director of the Pacific Northwest Seismic Network, and Thomas Heaton, director of the Earthquake Engineering Research Laboratory and professor of geophysics and of civil engineering at the California Institute of Technology, in organizing the summit. A system likely would be established in California first, because testing of a statewide network has been going on for at least five years, but the Pacific Northwest would be added as issues with the system are ironed out. But scientists up and down the coast would be working together to make the system work along the entire coast, Vidale said. “We’d all be sharing the data, because the faults don’t stop at the state borders, or at national borders,” he said. Steele noted that the system would have to be integrated with local emergency management efforts to be effective, because individual emergency managers know best what actions to take in their own locations. At the moment, funding for an earthquake early warning system is uncertain because of questions about the USGS budget. However, the seismologists and transportation experts present were adamant that the time is now. Archived webcast of April 5 briefing in which seismologists and transportation experts urged creation of an earthquake early warning system along the Pacific Coast. Left to right, John McPartland, Doug Given, Thomas Heaton, John Vidale and Richard Allen.